There’s something magical about a child experiencing their first bicycle. It’s a bright, shiny key to a whole new world of adventure. Unfortunately, there are far too many children that never get this wonderful childhood rite of passage. The foster care system is saturated with children whose caregivers are only able to supply the necessities of food, shelter and safety but very little ancillary items that many take for granted. Spokes 4 Hope is a nonprofit organization passionate about closing this gap so more young people can experience the wonder of pedaling a bicycle for the first time. 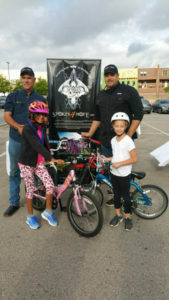 Spokes 4 Hope was established by retired Southlake police officer, Alton Wells in 2006. Law enforcement officers take an oath to serve and protect as part of their occupation but for many, these vows are ingrained in every fiber of their lives. This mindset is the organization’s firm foundation. The story began when fellow officer, Robert Hodges, developed a terminal brain tumor, Wells and his brothers in blue sprang into action. Their fundraising efforts allowed Hodges the peace of mind knowing his family would be financially stable even though his End of Watch was close at hand. Wells, and the other officers involved, realized the magnitude of their efforts and felt the need to continue answering the call to serve. Their desire was to continue fundraising efforts for a good cause. One officer shared his personal story of being the child of a struggling single mother and receiving the gift of his first bicycle. The difference a simple act of kindness made in his life was the inspiration the group needed to create a Spokes 4 Hope movement. Working closely with child advocacy centers, churches, schools and law enforcement agencies, the group identifies deserving children and families. 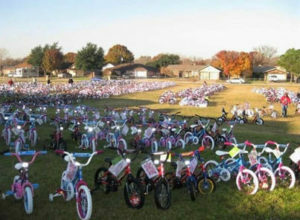 Many individuals, companies and corporations support the cause by volunteering their time to help assemble the numerous bicycles (many say it sparks excellent team building). 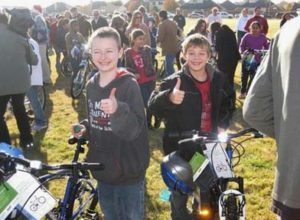 Each year Spokes 4 Hope distributes between 1,500 to 1,700 bicycles and helmets. Wells dreams bigger and hopes for 10,000 per year. Spokes 4 Hope has two major fundraising events each year. Community involvement is the key to their success. In the spring, Keller Williams Realty-DFW, along with Sky Creek Ranch Golf Club of Keller, host a golf tournament. In the fall, the Keller, Southlake, Watauga, and Fort Worth Police Departments join forces to host a motorcycle rodeo. Donations can also be made through their website, spokes4hope.com. Another avenue of fundraising comes directly from Wells. In 1997, he was involved in an on-duty motorcycle wreck. The accident left him with a broken neck and a level two brain injury. Against all odds, he survived. But even more miraculously, he learned to walk again, talk again and exceeded all the doctors’ expectations. He speaks to groups across the state about overcoming adversity, the will to never give in and never give up. The funds received from his motivational speaking goes directly to Spokes 4 Hope. One hundred percent of the donations received are spent on bicycles and helmets. None of it is used for administrative or salary purposes. All those involved in the organization are on a strictly volunteer basis. Click here to find out how you can help a deserving child ride on to a better life.